Recruitment owes its action shift to the Fourth Industrial Revolution that has turned around the way the job demand is now satisfied. According to Global Recruiting Trends 2017, 8 out of 10 global HR leaders see talent acquisition as a number one priority. The biggest problem is, definitely, a skilled labor shortage. At the same time, 56 percent of companies worldwide expect a higher hiring volume without an expanded recruiting team, which brings a clear struggle but also an extra push for recruiters to get creative in achieving one top hire instead of few mediocre ones. That’s the moment when Video Job Descriptions (VJDs) come handy with its personalized, authentic and highly impactful approach. In 2017, the top challenge for recruiters has appeared to be a competition for talent, while the problem of limited budget scored its second position. Nowadays, the new era of online talent acquisition has arrived. Such a strategy, definitely, eliminates all the hassles associated with traditional job postings. Interested in advancing your hiring process? Take a look at 500+ job description templates presented by TalentLyft to get you started. Overall, the vital question is arising: what should be done to differentiate your job offer and not spend a fortune on getting in the front line of the talent acquisition marathon? In order to stand out and involve some extra dedicated new workers into the team, learn to craft your offer accordingly. It only takes 50 seconds for a job seeker to review a single job offer before moving on to the other one. Therefore, you practically have around a minute to emphasize an employer brand through a job posting for a candidate to feel a potential fit with a company. Job descriptions that don’t excite or intrigue are driving away applications from both active and passive prospects. And, painfully dull text descriptions are simply not able to change it. In any case, the biggest part of recruiting budget is spent on job ads and recruitment agencies (over 50 percent in 2017), so it makes more sense to use it wisely and get the most out of it. Follow further to know what techniques will actually make a difference. Every candidate wants to feel a fit with a potential employer’s company culture. They want to learn what would it be like to work for this organization. In a video job description, you can include the footage of the office, the interaction between the colleagues, events happening, and enhance it with animated transitions, icons, and other visuals. It will help a candidate to decide whether your company’s environment matches the work style this prospective candidate is looking for. Such a visual interpretation will speak much louder than your text of “how amazing the workspace is” would. You can also include interviews with current employees to portray such personal anecdotes and show what job seekers could hope to accomplish if hired for a similar position. If you think you’ve already cut down your job description enough, think twice. We are a “snack-sized society”, and anything longer than few paragraphs get skimmed and might lead to a ton of unqualified applicants. So, keep the most relevant information: focus on the transparency of the responsibilities included, skills and qualifications required, salary and benefits provided. And mainly, be open about your organization, its goals, and missions. To make sure this attention is retained, enhance your job description with accompanying visuals to get a clear feel of what is being asked and provided for the candidate. This way, you spark interest through emotions, and emotions will not let your message to be forgotten. If your job description could pretty much describe a position at any of your competitors’ companies, you’re not getting creative enough. Craft your job description to pop and be memorable! It needs to stay in people’s minds even after they close their browser, and that’s a much easier job than you expected. According to Ongig’s study, VJDs get 487 percent increase in engagement over text ads. It’s a clear differentiation point to use! Millennials are truly a unique breed that in already 3 years will make up more than 50 percent of the workforce. Sometimes referred to as the “Peter Pan” generation, they highlight authenticity, sense of belonging, and culture in their workplace, also valuing humor much more than other demographic groups. Let’s recall a great success General Electric had with its “What’s Wrong with Owen” campaign, where combining both video and humor helped them to get more than 800.000 views, as well as improve recruiting numbers to attract Millennials. Inject some quirkiness into the video to accelerate recruitment of Generation Y.
Nowadays, almost everyone goes online to find their next job, so, job ads have to be crafted with SEO in mind. To get noticed, you need to pay attention to the taste of Mr. Google. And what Google loves the most? Clearly, video! It increases “stickiness” (or time on a page), attracts three times more inbound links for a higher ranking, also helps you to tap into the second largest search engine, Youtube. Moreover, videos are full of keywords if you accompany it with transcripts, which allows keywords to be highlighted and linked to your webpage. It shows Google how relevant your video is, which will increase your SEO ranking, and therefore, bring more interest towards your job posting. It is well-known that social recruiting is a cornerstone of today’s job market. But do you know what video job descriptions and social recruiting have in common? The roots are in consumer marketing. They truly engage on a more personal level by creating meaningful connections. In a highly competitive job market, the focus is not only made on the company’s HR expertise, but also on the marketing efforts involved to drive interest in the company and bring top talent. And exactly this marketing approach of video job descriptions delivers a personalized connection with a job seeker. Moreover, VJDs help to develop relationships that ultimately generate buzz around the employer brand that has a significant impact on the company’s ability to hire top talent. Now that you have a formula for a successful recruitment, you have to follow the steps to put it into practice and be ready for the flood of quality candidates coming your way! Embrace an innovative formula for your successful recruitment. 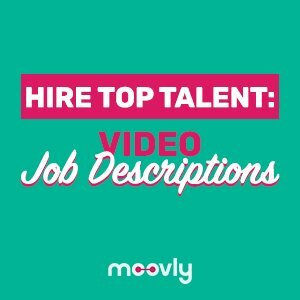 Accelerate your hiring process with video job descriptions created at Moovly.